In this issue of Among Ourselves you will find an official circular letter sent by the Congregation for Divine Worship and the discipline of the Sacraments on the preparation of altar bread and the sacramental wine for the celebration of the Holy Eucharist. We are very fortunate as our altar bread and sacramental wine are prepared by the Carmelite Sisters, who perform this duty with care and dedication. In fact, it is a service rendered to the diocese. They are not considered to be profit making ventures. We are grateful to them. I wish to take this opportunity to draw your attention to some points regarding altar bread. As you know the Sisters make available to us a regular supply of fresh altar bread. Therefore, great care must be taken to ensure that the hosts, we use, be always fresh. I have noticed occasionally that the altar bread used, appears to be stale. Perhaps because it has been kept for a long time before its use. From the taste one can say whether it is fresh or stale. I would urge you therefore, to ensure that the altar bread which we use for the sacrifice of Mass be always fresh. Every month when you come for your monthly Recollection, fresh stocks of hosts are made available through the Chancery Office. There is another important matter in connection with the Holy Mass. I have repeatedly drawn your attention to the importance of consecrating at each Mass only what would be sufficient for the congregation. Except on big feasts and at Shrines, we have a general idea of how many communicants there would be. Here again I find, despite repeated reminders, priests consecrate too many hosts and they are kept in the Tabernacle for several days. It is not proper to do so. Please ensure that, as much as possible, that at each Mass the faithful are given the opportunity to receive communion with a sacred host consecrated during that particular Mass. The two symposia on St, Joseph Vaz which were organized in the month of July for the priest-representatives of all the Dioceses in Sri Lanka were, well attended and much appreciated. With a few months more for the conclusion of the Year of St. Joseph Vaz, let us intensify our efforts to achieve the important objectives of this year. I wish to emphasize particularly, the personal attention that all the Clergy should have on enriching our families to be devout and emulate the example of the Holy Family of Nazareth. Pastoral visitation of all the families in the parish is a must for this. The whole country is concerned about the dengue epidemic with so many people filling up hospitals. It is urgent that we use all our structures like Parish Associations, Youth, Catechists, Holy Childhood animators and the Families to become aware that there is no other solution except to prevent the dengue mosquito from breeding and spreading. It is good that we make a concerted effort to animate our families to take up leadership to keep their own surroundings and environment clean and free of mosquito breeding places. We should not wait until tragedy strikes us or our families in our parishes. In this context what the Holy Father said in “Laudato Si” is so relevant , and we should make our people aware of the need to be committed to care for our “common home”. Before concluding, I would like to mention that the theme for the XVI General Synod of Bishops, scheduled for October 2018, will be “ Young People, the Faith and Vocational Discernment”. In the months ahead we shall study this theme in detail with a view to preparing for the synod and to accompany our young people along the path of life towards maturity. Wishing you all God’s blessings and in union of prayers. 1.At the request of the Holy Father, Pope Francis, the Congregation for Divine Worship and the Discipline of the Sacraments is writing to Diocesan Bishops (and to those who are their equivalents in law) to remind them that it falls to them above all to duly provide for all that is required for the celebration of the Lord’s Supper (cf. Lk 22: 8,13). It is for the Bishop as principal dispenser of the mysteries of God, moderator, promoter and guardian of the liturgical life in the Church entrusted to his care (Cf. CIC can. 835 § 1), to watch over the quality of the bread and wine to be used at the Eucharist and also those who prepare these materials. In order to be of assistance we recall the existing regulations and offer some practical suggestions. 2. Until recently it was certain religious communities who took care of baking the bread and making the wine for the celebration of the Eucharist. Today, however, these materials are also sold in supermarkets and other stores and even over the internet. In order to remove any doubt about the validity of the matter for the Eucharist, this Dicastery suggests that Ordinaries should give guidance in this regard by, for example, guaranteeing the Eucharistic matter through special certification. The Ordinary is bound to remind priests, especially parish priests and rectors of churches, of their responsibility to verify those who provide the bread and wine for the celebration and the worthiness of the material. It is also for the Ordinary to provide information to the producers of the bread and wine for the Eucharist and to remind them of the absolute respect that is due to the norms. a) “The bread used in the celebration of the Most Holy Eucharistic Sacrifice must be unleavened, purely of wheat, and recently made so that there is no danger of decomposition. It follows therefore that bread made from another substance, even if it is grain, or if it is mixed with another substance different from wheat to such an extent that it would not commonly be considered wheat bread, does not constitute valid matter for confecting the Sacrifice and the Eucharistic Sacrament. It is a grave abuse to introduce other substances, such as fruit or sugar or honey, into the bread for confecting the Eucharist. Hosts should obviously be made by those who are not only distinguished by their integrity, but also skilled in making them and furnished with suitable tools” (n. 48). b) “The wine that is used in the most sacred celebration of the Eucharistic Sacrifice must be natural, from the fruit of the grape, pure and incorrupt, not mixed with other substances. […] Great care should be taken so that the wine intended for the celebration of the Eucharist is well conserved and has not soured. It is altogether forbidden to use wine of doubtful authenticity or provenance, for the Church requires certainty regarding the conditions necessary for the validity of the sacraments. Nor are other drinks of any kind to be admitted for any reason, as they do not constitute valid matter” (n. 50). 4. In its Circular Letter to the Presidents of the Episcopal Conferences regarding legitimate variations in the use of bread with a small quantity of gluten and the use of mustum as Eucharistic matter (24 July 2003, Prot. N. 89/78 – 17498), the Congregation for the Doctrine of the Faith published the norms for the celebration of the Eucharist by persons who, for varying and grave reasons, cannot consume bread made in the usual manner nor wine fermented in the normal manner. a) “Hosts that are completely gluten-free are invalid matter for the celebration of the Eucharist. Low-gluten hosts (partially gluten-free) are valid matter, provided they contain a sufficient amount of gluten to obtain the confection of bread without the addition of foreign materials and without the use of procedures that would alter the nature of bread” (A. 1-2). b) “Mustum, which is grape juice that is either fresh or preserved by methods that suspend its fermentation without altering its nature (for example, freezing), is valid matter for the celebration of the Eucharist” (A.
c) “The Ordinary is competent to give permission for an individual priest or layperson to use low-gluten hosts or mustum for the celebration of the Eucharist. Permission can be granted habitually, for as long as the situation continues which occasioned the granting of permission” (C. 1). 5. The same Congregation also decided that Eucharistic matter made with genetically modified organisms can be considered valid matter (cf. Letter to the Prefect of the Congregation for Divine Worship and the Discipline of the Sacraments, 9 December 2013, Prot. N. 89/78 – 44897). 6. Those who make bread and produce wine for use in the Mass must be aware that their work is directed towards the Eucharistic Sacrifice and that this demands their honesty, responsibility and competence. 7. In order to facilitate the observance of the general norms Ordinaries can usefully reach agreement at the level of the Episcopal Conference by establishing concrete regulations. Given the complexity of situations and circumstances, such as a decrease in respect for the sacred, it may be useful to mandate a competent authority to have oversight in actually guaranteeing the genuineness of the Eucharistic matter by producers as well as those responsible for its distribution and sale. It is suggested, for example, that an Episcopal Conference could mandate one or more Religious Congregations or another body capable of carrying out the necessary checks on production, conservation and sale of the Eucharistic bread and wine in a given country and for other countries to which they are exported. It is recommended that the bread and wine to be used in the Eucharist be treated accordingly in the places where they are sold. From the offices of the Congregation for Divine Worship and the Discipline of the Sacraments, 15 June 2017, Solemnity of the Most Holy Body and Blood of Christ. he future saint was born on January 3, 1840, and named Joseph. He was the seventh of eight children of Frans and Anne-Catherine de Veuster, Flemish speaking farmers who lived in Tremelo a village near Louvain, Belgium. They were good Christians with Anne-Catherine taking care of the religious training of the children. Joseph was a normal child playing in the games of his peers, but there was this difference. At the age of four, he drifted away from his parents at a country fair and was found in a church praying before the altar. He loved solitude and stillness and liked to go out where the shepherds tended their sheep and stay the whole day with them. He also was charitable helping others. He stayed up all night nursing the sick cow of a widow neighbor. At the age of 13 he was able to do a day’s work on the farm so his father took him out of school. Of the eight children four entered the religious life. Two of the girls became Ursuline nuns and Joseph’s older brother, Auguste, entered the seminary of the Congregation of the Sacred Hearts of Jesus and Mary in Louvain and was named Pamphile in religion.Joseph, a strong and healthy lad, worked on the farm for five years and then followed his brother into the Sacred Hearts Order. He had good intelligence but was not as scholarly as Pamphile, and with an inadequate education was not considered suitable for the priesthood. But Pamphile offered to teach him Latin and Damien made so much progress in a short period of time, that the superior changed his mind and allowed him to study for the priesthood. In the seminary, Damien was modest, hardworking, eager to learn, amiable and while not exactly handsome people were struck by his physical presence—the picture of health. He had a wonderful resourcefulness. After his hour of adoration from 2 to 3 a.m. (a practice of the Sacred Hearts Order), he did not go back to sleep. He shared a room with Pamphile who woke up one night and noticed Damien’s bed empty. He found him rolled up in a blanket sleeping on the floor. On October 7, 1860, before the seminary church altar prostrated on the floor covered with a black mortuary pall and sprinkled with holy water—dead to the past world and dead to self—Damien made his profession. He was now a religious, a new life for him, and signed the register with forceful pen strokes, which revealed the intense determination of his character. But where was he to go? He spent some time at the mother-house of the Congregation in Paris but the big city was not for him. He preferred rural areas and dreamed of going far away. In fact, he prayed every day before a picture of St. Francis Xavier, asking for his intercession so that he too could be a missionary. The voyage of 148 days, around Cape Horn, with all its trials of sea sickness, monotony, and tense moments in turbulent waters, and no stops at ports, finally ended in Honolulu on March 19, 1864. The field of mission for the Sacred Hearts Fathers was a population of 60,000 Hawaiians on eight major islands. One third of the population was Catholic. Damien and two other young Brothers were sent to the mission college at Ahuimanu to continue their studies for the priesthood and were ordained on May 2, 1864. After eight months, Fr. Evrard’s body wasn’t strong enough to continue in such a vast area. He talked it over with Damien if they could switch districts and the superiors gave the permission. Now Damien would have to minister over 1,000 square miles to a scattered population of 2,000 with less than half Catholic. It took six weeks to visit all the villages, baptizing and hearing confessions, but with his extraordinary endurance, Damien remained in good health. Some of the villages could only be reached on foot. To get to one, ten ravines had to be crossed over and then a 2,000 foot cliff had to be climbed. When asked by a Hawaiian where he lived, he pointed to his saddle: “This is my home.” He had two horses and two mules and carried his Mass equipment on his back. During his time in Puna, Damien built four chapels and in Kohala-Hamakua a number more. When he had the chance, he took a ship to Honolulu for some important business such as ordering lumber for church building. A schooner would unload the lumber on the shoreline and he and his Hawaiian helpers would then carry the wood to the building site. When a chapel was finished, there was a big feast where people from other villages would also come for the festivities. These were Damien’s happiest times. When he went to Honolulu, the Bishop and provincial of the mission were glad to see him with his “fine face, broad, glowing with health.” With the exception of Honolulu with all its parishioners and priests, there were more baptisms on Hawaii than any other island. In 1820, Calvinists from New England, were the first to evangelize the Hawaiian Islands and when the Sacred Hearts Fathers arrived seven years later they were treated as intruders. In the first years, Catholic converts were persecuted and priests driven out. But from the Catholic perspective, they had every right to be there since the natives were not receiving the true Faith. In 1840 Mormons arrived and in 1862 Anglicans came “creating a confused religious picture.” The Calvinists were the dominant group until 1860 when many of them took to profitable sugar planting. Now the Catholics were moving toward the ascendancy but Damian had his work cut out. There had not been a Sacred Hearts Father in Hawaii Island for several years and the Catholic Faith had almost died out there. He did not like the Calvinists and stood up to them. Eventually religious tolerance laws were passed. The missionary also had to contend with the native religion with its high-priest and medicine-man the Kahuna. Then there was the free sexual expression which was part of the traditional Hawaiian culture. The kanaka (Hawaiians) scoffed at the white man’s morality. After eight years of isolation, Damien, who normally did not see another priest for months, asked for an assistant and Fr. Gulstan Ropert was sent. Damien would keep Kohala while Ropert would take Hamakau. Both whites and Hawaiians were concerned that the prevalence of leprosy in the islands would make them unlivable. Strict leprosy laws were established and anyone who contracted the disease was sent to the leprosy settlement, Kalawao, on Molokai. This was a life sentence and many tried to hide rather than being sent there. The Sacred Hearts mission was also concerned. There were Catholics in the settlement at Kalawao and with no priest, they died without the sacraments. Damien had been in the Hawaiian Islands for about nine years when he went to Maui for the blessing of a new church by Bishop Maigret. Many other priests were there and the Bishop took the occasion to meet with them regarding Molokai and the leprosy settlement, looking for a way to minister to the sick there. The Bishop was reluctant to assign a priest because of the contagious nature of the disease. Damien and three other priests came up with a plan where they would take turns of two weeks or a month at a time and the Bishop accepted the proposal. Damien would be the first to go. The decision to send a priest to Molokai made headlines in the Honolulu newspapers but only Damien was mentioned without the others. He was immediately a hero. Money came in for the mission and Damien was the talk of the town. Because of what happened, the Bishop had no choice but to scratch the plan and send only Damien. Sacred Hearts priests had been there before but not permanently and a Sacred Hearts Brother built the church of St. Philomena at the settlement. Protestants did send a pastor but he was a Hawaiian who had contracted leprosy and went with his wife. Calvinists never sent whites and were embarrassed when the Sacred Hearts Fathers were assigning a priest there permanently. They had no response. They could not send a parson who would have to leave his family, and it was unthinkable for him to take his family with him. On May 10, 1873, a ship with Damien, the Bishop, fifty leprosy victims and some cattle landed on Kalawao. Damien had an “unequivocal presentiment” about Molokai. He heard an “inner voice” telling him that he will never go back. With the strict segregation and isolation laws only Board of Health members could go back and forth to Kalawao. Damien was not permitted to leave. When the provincial went to see him, he was not allowed to go ashore and when Damien went out to the ship in a small craft he was not allowed to go on board. He had to make his confession by shouting his faults to the provincial who, leaning across the railing of the ship, shouted back his absolution. Eventually, there was a relaxation of the laws and Damien was not disturbed when going back and forth. 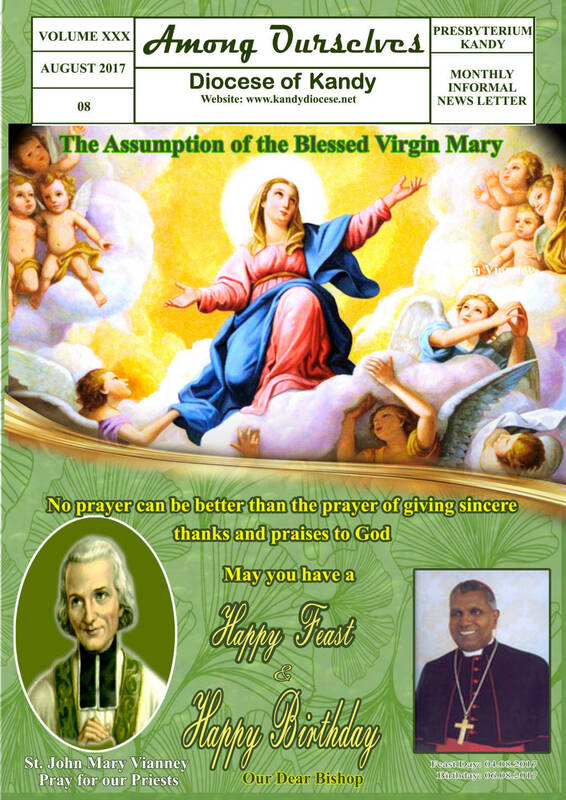 Commemorating the Country’s first Canonized Saint; Saint Joseph Vaz, The Catholic Bishops’ Conference of Sri Lanka declared the year 2017: “The year of St. Joseph Vaz”. 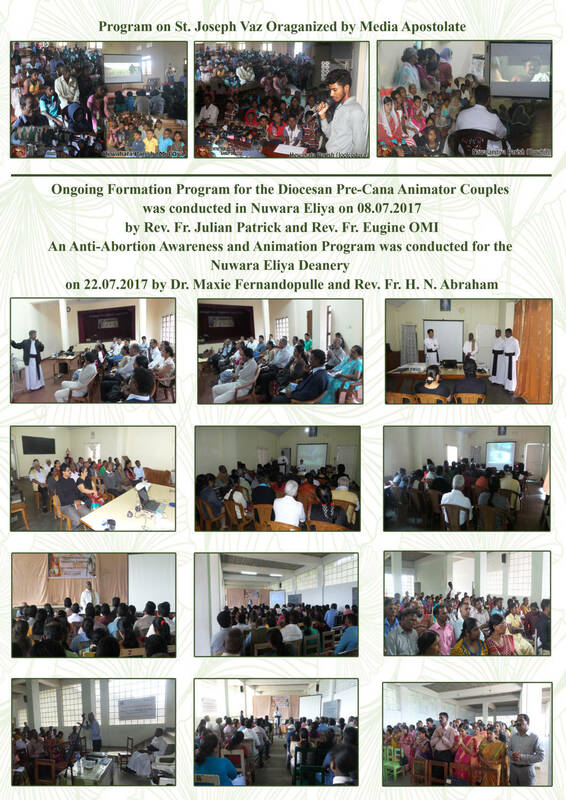 Both symposia were held at the Fatima Retreat House in Lewella, Kandy and they were sponsored by the AFJ – Misereor and hosted by the Human Rights Office in Kandy. The Symposia were held in two consecutive sessions; first from 03rd to 05th July and the second from 10th to 12th July. Both sessions were graced by the presence of His Lordship Bishop Vianney Fernando who inaugurated the sessions with his keynote address where the bishop reiterated that; “God has shown his love for the people of this country by making Joseph Vaz a Saint” The Bishop further said that his dedication in reviving the faith of the Catholics during the Dutch persecution should not be forgotten, as St Joseph Vaz is the greatest missionary that Asia has ever produced. Further, the Bishop noted that devotion and Faith are two completely different things and that what should be focused is faith. The Symposia provided a platform for priests from across Sri Lanka, to get together and share their knowledge and experience on St. Joseph Vaz. The symposia had a rich turn out of priests from all parts of the country and resource persons as well. 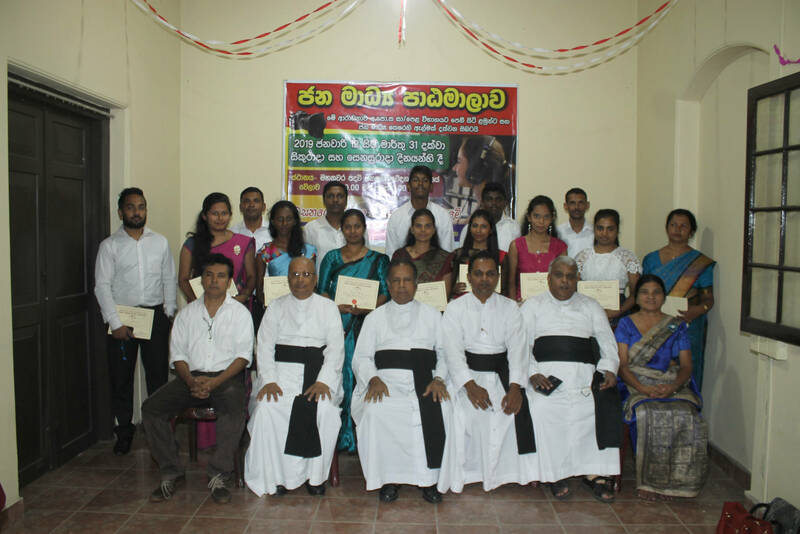 During the first symposium; priests from Colombo, Galle, Mannar, Trincomalee, Chillaw and Kandy dioceses were present and for the second symposium; Bishop Cletus Perera OSB joined the priests from Jaffna, Badulla, Anuradhapura, Kurunegala, Batticoloa and Rathnapura dioceses. A number of resource persons from across the country conducted sessions and at the end of each session, there were discussions and the priests shared their views towards commemorating St. Joseph Vaz and his teachings. 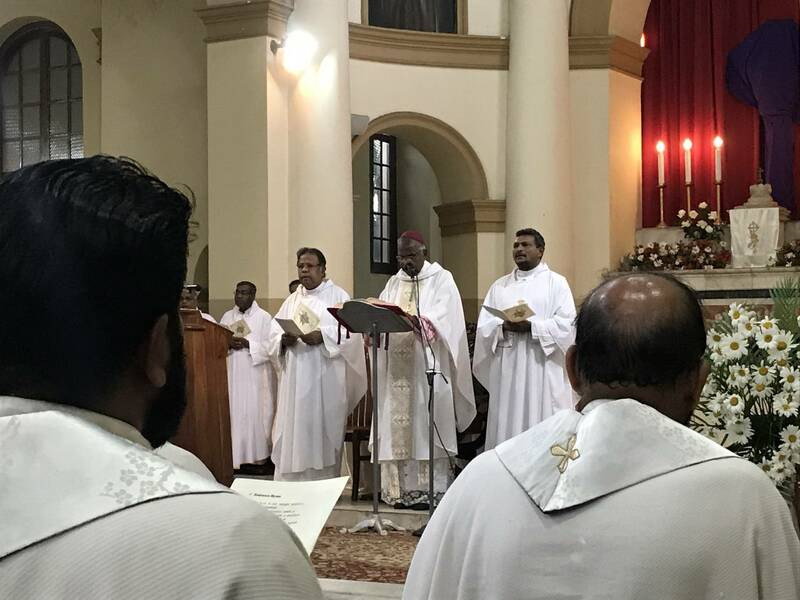 Bishop Cletus Perera in his homily during the second symposium highlighted the importance of recognizing and understanding the mission of St. Joseph Vaz in Sri Lanka where the Church was not visible. Further, he emphasized the spirituality of St. Joseph Vaz and providence of God. Fr. Lawrence Fernando, in his presentation on “Environment of the Mission of St. Joseph Vaz” gave details on the background of the Sri Lankan society, its administrative structure and the culture in general during the time of St. Joseph Vaz in Ceylon. Fr Edward Christy in his presentation on “Inculturation of St. Joseph Vaz as a Sri Lankan Missionary” highlighted the importance of understanding and becoming a part of a country’s culture. Fr Alvin Fernando, in his presentation on “Priestly Spirituality of St. Joseph Vaz” brought out how St. Joseph Vaz had deep faith in God, himself and on others equally and encouraged the faithful to be with the Lord. Fr Nerio Abraham presented the missionary strategies of St Joseph Vaz and challenged the participants to know their faithful, their sufferings and their challenges. “Each territory and government should encourage responsible ways of acting in its citizens so that, with inventiveness, they can interact and favor the creation of a more habitable and healthier house,” the Pope said. “Placing on each one the little that corresponds to him in his responsibility, much will be achieved.” Pope Francis sent his letter, dated June 12, to participants in an international congress about his 2015 environmental encyclical “Laudato Si” and the challenges of those dwelling in large cities. The July 13-15 congress, held in Rio de Janeiro, Brazil, was organized by the foundation “Antoni Gaudi for Great Cities” of Barcelona in collaboration with the Archdiocese of Rio de Janeiro. In the message, Pope Francis pointed to references made in “Laudato Si” about the particular needs of people who live in large cities. These needs, he explained, need to be met with “three Rs:” respect, responsibility and relationship. “Respect is the fundamental attitude that man must have with creation. We have received it as a precious gift and we must strive for future generations to continue to admire and enjoy it,” he said. Just like other elements of our earth, clean and drinkable water points to God’s love of his creatures, he continued, and societies have an obligation to guarantee safe water for everyone, because when water is not given the respect and attention it requires, it becomes a source of disease and a danger to society. The Pope noted that in both rural areas and large cities there is a growing lack of relationship. You see this in cities especially, he said, where you have a busy flow of people in and out. Regardless of the causes, this can help to create a more multicultural society, fostering wealth and social and personal growth. But it can also make the society more closed and suspicious of each other. “The lack of roots and the isolation of some people are forms of poverty, which can degenerate into ghettos and lead to violence and injustice. Instead, man is called to love and to be loved, establishing bonds of belonging and bonds of unity among all his fellow men,” he urged. A practical way to do this is through the formation of groups in schools or parishes – communities that help build communion, a sense of belonging, and a network of support. “It is important for society to work together in a political, educational and religious context to create warmer human relationships, to break the walls that isolate and marginalize,” he concluded. Mother Teresa was canonized / made a saint on 4 September, 2016. Many may call to mind an exchange between the nun and the Democratic nominee for president, Hillary Clinton. In 1994, Mother Teresa addressed a National Prayer Breakfast with bold warnings, where Hillary sat across from her and asked just one question of the nun, and Hillary was left looking like an idiot as she was answered with six simple words. Mother Teresa stood 4′ foot 9″ inches, but she was a force to be reckoned with even when addressing the President of the United States and then First Lady Hillary Clinton. As the keynote speaker at a prayer breakfast in 1994, Mother Teresa came to Washington, DC to chastise the Clintons and their pro-abortion stance. During the event, Hillary asked Mother Teresa one question, but parts of the nun’s speech, directed at the Clintons, are worthy of review to understand what happened first. In her remarks, prior to Hillary’s question, Mother Theresa said: “… I feel that the greatest destroyer of peace today is abortion, because it is a war against the child, a direct killing of the innocent child, murder by the mother herself. By abortion, the mother does not learn to love, but kills even her own child to solve her problems. Noonan went on to describe what happened when Mother finished her speech: “Well, silence. Cool deep silence in the cool round cavern for just about 1.3 seconds. And then applause started on the right hand side of the room, and spread, and deepened, and now the room was swept with people applauding, and they would not stop for what I believe was five or six minutes. As they clapped they began to stand, in another wave from the right of the room to the center and the left. Mother Teresa, not missing a beat, looked at her and said, “Because she has probably been aborted.” If ever there was a “drop mic” moment, I would say that Mother Teresa nailed it with that response. Hillary is so sick with her desire for the White House recently that she has been trying to cash in on pictures of herself with Mother Teresa for her campaign. Luckily, a catholic advocacy group has forbidden the Clintons from using Mother Teresa in any of their literature or TV commercials. The Eymard House of Priests Association, Blessed Sacrament Community and I wish to inform you that we are completing ten years of “Ministry to Ministers” on this July 15th. 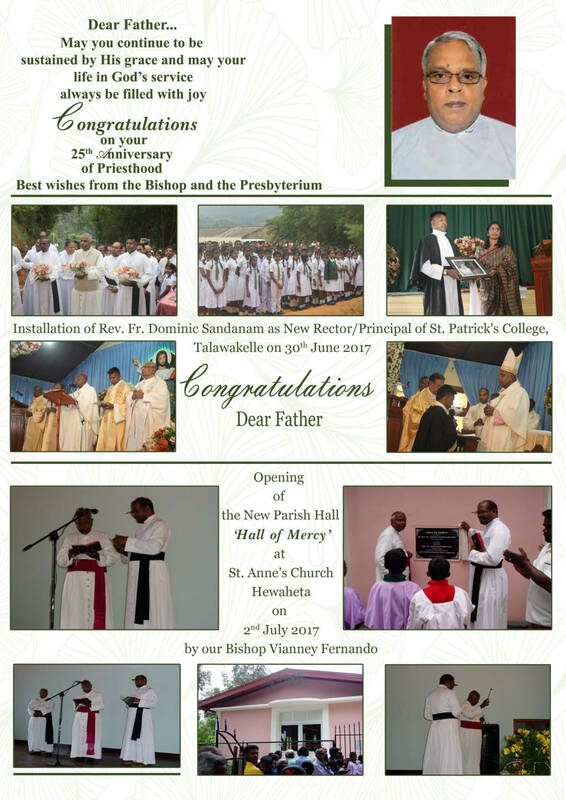 The initial Blessing of the Ministry and the House was done by His Lordship Bishop Winston Fernando, SSS on July 15, 2007. At the request of our Provincial Fr. Dilan Fernando, SSS we have fixed the date of this 10th Anniversary Celebration to Thursday, August 17th, 2017. His Lordships Bishop Winston Fernando, SSS & Bishop Vianney Fernando have agreed to Grace the occasion on August 17th. We are cordially inviting you to concelebrate at the Holy Eucharist on that day at 11.00-arn-an-d— to Lunch at Collingwood Bungalow, 112, Badulla Road (Queen Elizabeth Drive), Nuwara Eliya. Since you have been to the Eymard House of Priests with your family, we would be delighted if you could bring along with you one or two members of your family too. So, please keep August 17, 2017 reserved for this occasion to give Praise and Thanks to God and honor St. Peter Julian Eymard who had Ministry to Priests close to his heart. email me @ srupasinghe2001@hotmail.com by July 20th, 2017 of your availability to attend the Eucharist on August 17th. President: Fr. Sunil Rupasinghe, Psy. D.